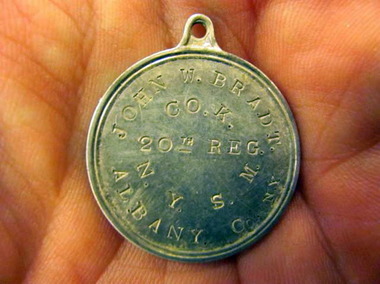 BATH, Ohio — Finding a 152-year-old Civil War identification tag put Jeffrey Rees ahead of his competitors, all 200 of them. 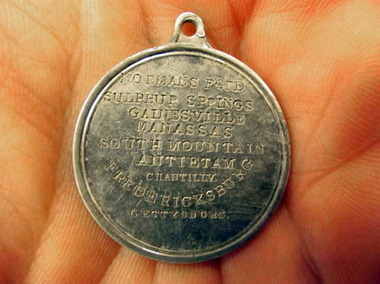 The identification tag of John W. Brandt, a Union solider, won the 33-year-old Bath resident the Best Overall Find during the 2013 Grand National Relic Shootout in March near Richmond, Va. The silver tag set off Rees’ detector the last day of the two-day competition. Rees’ team, Teknetics, which is a brand of metal detectors, won first place. The team also placed first last year. Reading the tag like a history book, Rees gleaned some interesting details about Brandt, who was from Albany, N.Y.
After the competition, Rees dug even deeper. He learned that Brandt enlisted in the Union Army in 1861 at the age of 27. The location where Rees found the tag was where Brandt camped before heading to Petersburg, Va. That’s where his research showed that Brandt lost it in 1863. Brandt had just re-enlisted after suffering from an injury that took him off the battlefield. His brother served in the same unit. Brandt stayed in the army until 1866, Rees said. Rees has been metal detecting since he was about 6-years-old when his father George introduced him to the hobby. Rees said that the tags are something that he would only dream about, but never imagine actually believe he could find one. But what really got the history buff excited, who majored in history and business at Muskingum University, is something that many people will never have the opportunity to do.